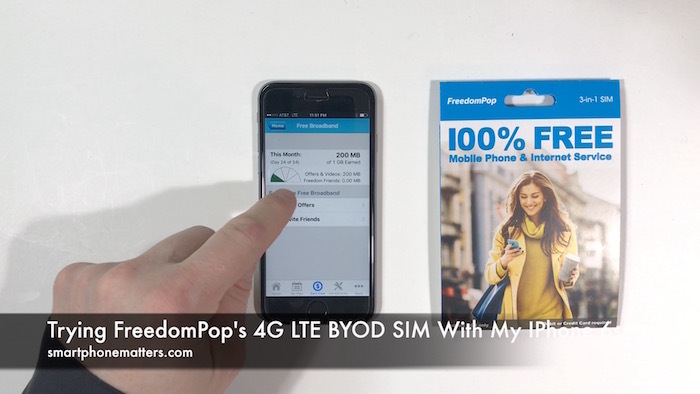 Recently, I decided to try out FreedomPop’s 4G LTE BYOD SIM Kit with my iPhone 6s. I also plan to try it with my Nexus 6 using Android and I’ll tell you about that in an upcoming article and video. The card and SIM are perforated. You can remove the standard SIM from the plastic card, the micro SIM from the standard SIM, and the nano SIM from the micro SIM. Now, It doesn’t say it anywhere but this SIM card uses the AT&T 4G LTE network. There are also some instructions printed on the inside of the package. They tell you how to activate your SIM if you bought it from a retailer. They also tell you how set up the APN for Android and iOS and that you need to install the FreedomPop apples from the Google Play store and Apple’s App Store. Both my iPhpne 6s and Nexus 6 use a nano SIM so I punched out the nano SIM from the card. After I inserted by nano SIM in my iPhone 6s, the status bar showed a 4G connection on the AT&T network. When you see a 4G connection on the iPhone, it means HSPA+, not LTE. For some reason when you put a new SIM in a phone it takes a little while before it connects to the LTE network. After putting the SIM in the phone, I tried to use my cellular data by visiting smartphonematters.com using Safari but it didn’t work. I received a “Could Not Activate Cellular Data Network” error. This is because FreedomPop doesn’t automatically set up the APN. The instructions on the back of the package said to install the FreedomPop app and use that to install a cellular data APN profile to set up the phone. I went to the App Store and found two apps from FreedomPop, FreedomPop and MyFreedomPop. I installed both apps. I opened the FreedomPop app and signed in using my FreedomPop account. The app setup walks you through installing the cellular data APN profile. The APN profile is a configuration profile that sets your APN so you can use your cellular data. You can ignore the warning message about monitoring your cellular data traffic. After installing the APN profile, I went back to Safari and I was able to visit smartphonematters.com, so cellular data was working. Make sure to turn off Wi-Fi first. After going back to the FreedomPop app it guides you through allowing push notifications and importing your contacts. The next screen was an offer for a free trial for international calling but I declined it. Finally FreedomPop prompted for access to the microphone which it needs for phone calls. When done, I was left at thee FreedomPop dialer. Now before trying out the FreedomPop service, you need to understand how this works. So pay attention, this is important. You have to use the FreedomPop app to make and receive phone calls as well as send and receive SMS text and MMS picture messages. If you take a look at the FreedomPop app again you’ll see they have options for Phone, Texts, Voicemail, Recents and Contacts. If you try to make a phone call using your iPhone’s Phone app, it doesn’t work. If you look in Settings > Phone you’ll see it doesn’t know your phone number. You make and receive calls through the FreedomPop app. In the video, I demonstrate placing and receiving a call as well as listening to a voicemail all using the FreedomPop app. You’ll also need to use the FreedomPop app for sending and receiving text and picture messages. In the video, I demonstrate this. You’ll have to use the FreedomPop app for SMS and MMS text messages. Your iPhone’s Messages app will still work but only for iMessages. Most iPhone users rely on the Messages app to exchange text and picture messages with other people.You’ll need to understand a little about how Messages works and how it will work with FreedomPop. Apple’s Messages app delivers messages two different ways. When you are exchanging messages with people using iPhones or other Apple products, it uses iMessage. iMessage uses your internet connection or cellular data to exchange messages. When you see your message in a blue bubble, it was delivered using iMessage. When you exchange messages with anyone not using an iPhone or Apple product, Message’s uses SMS for text messages or MMS for picture messages. SMS and MMS are the technology wireless companies use to exchange texts and pictures. So if you currently use Messages to exchange texts or pics with someone using an Android phone, you’ll need to use the FreedomPop app. Any text messages you receive from your bank, pharmacy, or any other reminders or alert messages will go the FreedomPop app. Now about Messages. Apple’s Messages app delivers messages two different ways. When you are exchanging messages with people using iPhones or other Apple products, it uses iMessage. iMessage uses your internet connection or cellular data to exchange messages. in Messages, When you see a the message in a blue bubble, it was delivered using iMessage. When you change messages with anyone not using and iPhone or Apple product Message’s uses SMS for text messages or MMS for picture messages. SMS and MMS is the technology wireless companies use to exchange texts and pictures. So if you currently use Messages to exchange texts or pics with someone using an Android phone, you’ll need to use the FreedomPop app. You’ll still be able to use Messages with FreedomPop. But you’ll only be able exchange messages with other iPhone users using iMessage. If you want to exchange messages with someone using any other type of phone than iPhone, you’ll need to use the FreedomPop app. Also, when you use iMessage you can choose to receive messages send to your phone number as well as one or more email addresses. Most people choose to receive messages using their phone number. I was able to use Messages with FreedomPop to exchange messages using my email address but not my FreedomPop phone number. I read that iMessage uses SMS text messages activate your phone number with the service. Becuause FreedomPop only supports SMS messages using the FreedomPop app, the service is unable to activate my phone number. Note that FreedomPop has an article on freedompop.com that describes how to set up Messages. I’ll continue to spend time to see if I can get iMessage to recognize my FreedomPop phone number in the future. Finally, I tried out the MyFreedomPop app. Once you log in you can use this app to manage your FreedomPop account. You can track your account balance and data usage as well as earn more free data or add premium services. It’s nice to have an app to do this and most carrier’s have an app for this now. I’m not going to go all the features now. I did want to mention the app seems to crash frequently when I use it with a Wi-Fi connection. In this article, I wanted to share with you my experience learning about and setting up FreedomPop with my iPhone. They are a number of trade offs to understand about using this service. They offer both free and premium mobile phone and wireless internet service. In a future article and video I’ll share my thoughts and opinions about using the FreedomPop with the iPhone.